Do you have a right to film the police? Sandra Bland was arrested and told to put phone down by Brian Encinia. 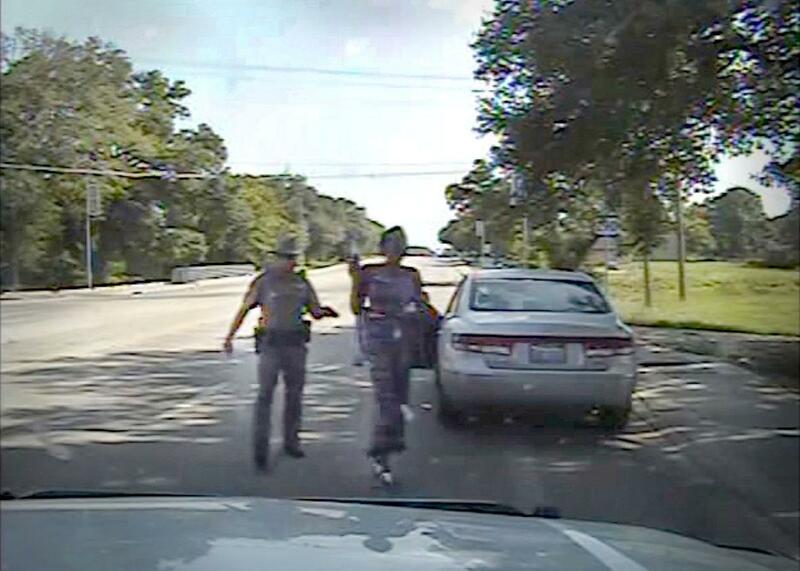 Did Sandra Bland Have a Right to Film Her Arrest? An image from the police dashcam video from the traffic stop of Sandra Bland in Prairie View, Texas, on July 10, 2015. The dashcam footage of Sandra Bland’s arrest is disturbing for a number of reasons—including trooper Brian Encinia’s apparent use of excessive force in subduing Bland. But for civil liberties advocates, a less dramatic moment of the footage is nearly as disquieting. When Bland attempts to film the encounter on her cellphone, Encinia demands that she “get off the phone.” When Bland insists that she has “a right to record,” Encinia repeatedly barks, “PUT YOUR PHONE DOWN!” Eventually, she does. It’s clear she had no choice. Encinia seems extremely confident that he could force Bland to stop recording her own arrest. He should not be, because his command was almost certainly illegal. The overwhelming majority of federal courts to consider the issue have held that the First Amendment protects an individual’s right to record the police in public. That right very likely extends to one’s own arrest. Encinia claimed that he arrested Bland for assaulting him. But in the video, it is Encinia who is most likely breaking the law. Although the Supreme Court has never squarely held that the First Amendment protects a “right to record,” four federal circuit courts—as well as myriad districts courts—have affirmed that we all have a free speech right to record police in public. In a 2012 case called American Civil Liberties Union of Illinois v. Alvarez, the 7th U.S. Circuit Court of Appeals cogently explained the logic behind this theory, writing that the “act of making” an audiovisual recording is “a corollary of the right to disseminate the resulting recording.” The unquestioned “right to publish or broadcast” the recording “would be insecure, or largely ineffective,” if the state could ban the act of the recording in the first place. As an analogy, the court noted that the state surely couldn’t ban individuals from taking notes or photographs in public without violating free speech. Why should it be allowed to ban cellphone videos? To make this argument, the 7th Circuit relied largely on one ruling: Citizens United. In that controversial case, the court invalidated a federal restriction on how much money corporations and unions could spend electioneering. The government, the court held, can’t “repress speech by silencing certain voices at any of the various points in the speech process.” Citizens United is widely reviled by left-leaning civil libertarians—but this conception of a speech process also protects the right to record. The issue in Citizens United was that the government effectively restricted corporations from financing some campaign ads by capping how much money they could spend. The issue in Alvarez was that the state effectively restricted the dissemination of videos by attempting to halt their recording in the first place. In affirming a right to record, the 7th Circuit carved that line out of Bellotti and plunked it right down into Alvarez. When a state restricts the right to record, the court explained, it limits “the stock of information” we all draw from to debate public issues. By forcing bystanders and arrestees to turn off their cameras, police officers are essentially depriving the public of the key piece of information in any subsequent public debate. Texas currently has no law against filming police officers in public (though some Republicans would like to pass one). Still, without an unambiguous ruling to the contrary, most officers will probably assume that shutting down filming is within their power during an arrest. It is not, and the 5th U.S. Circuit Court of Appeals (which encompasses Texas) should say so soon. Had Bland been allowed to exercise her right to record, we might have footage of the key confrontation—which occurs just beyond the dashcam’s scope—when the encounter grew violent. Bland, and the public, had a right to that information. We are all worse off for its absence.